When is the Right Time to Order Mothers Days Flowers? As Mother’s Day quickly approaches, it’s time to start thinking about sending that special lady in your life a lovely bouquet of fresh flowers to show her how much you care. It’s never too early to start thinking about how to do this affordably, where to order them from and what type of flowers to get. Fortunately for you, there are many options when it comes to ordering a floral arrangement that will make her feel special on this momentous day. What type of flowers should I get? As a matter of tradition, Mother’s Day flowers are generally carnations and roses, however sweet and simple flowers like mums and daisies are also nice choices when it comes to sending a thoughtful floral arrangement to make her feel special. When it comes to flowers, you may want to consider the color of the flowers and how that will be meaningful to the recipient. For example, for your wife, it would be perfectly OK to order her a bouquet of red roses, possibly mixed with some purple or yellow carnations. But this may be overly romantic for your own Mother, who would probably respond best to a bouquet of yellow or baby pink roses mixed with some lovely cream or yellow carnations. It’s best to consult with a florist to see what options are available for different recipients, but if in doubt you can always go with lighter colors for a parent and darker more romantic colors for a love partner. How shall I order the flowers? In this day and age, there are so many options available for you to order fresh flower bouquets, but you will want to think about how you want them to be delivered in order to make the best decision. 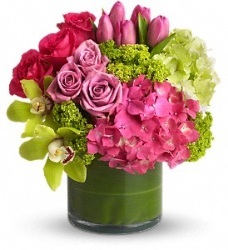 If you prefer to deliver them in person, you may want to order a special floral arrangement from your local florist. It’s important to order ahead of time, a minimum of two weeks in advance of the day you plan to pick the flowers up so that they can be ready in time. The flowers will be fresh, beautiful and your Mother will enjoy them even more since you will be stopping by to visit her in addition to bringing her flowers. If you are sending flowers to a Mother who lives too far away to visit in person, then you may want to go with a reputable online flower and gift ordering site. The benefit with this is that you can order months in advance for all those special occasions, often with discounts included and then not have to worry about it. Your Mother will receive a beautiful high quality bouquet on that special day and you will be a hero. When is the best time to order flowers for Mother’s Day? Since Mother’s Day is the second Sunday in May, you will want to order in plenty of time so that your special lady receives them on that day. The same rule applies if you are ordering the flowers locally or by calling a national flower service or ordering them online. The best rule of thumb is to order your floral gifts a minimum of two weeks ahead of time. So in the case of Mother’s Day, you will want to order your flowers by the third week of April in order to guarantee that your Mother or Wife will have these flowers to enjoy on Mother’s Day. Preparing for Mother’s Day is not as stressful as you may think. Being prepared for every special occasion is made easy by the many local and online services that are available nowadays. If you are still unsure of what to get someone for Mother’s Day, it’s always a good idea to consult with a florist for more information about the flowers, ordering process and other gift options. This entry was posted in Shopping and Product Reviews on January 23, 2014 by admin_z.